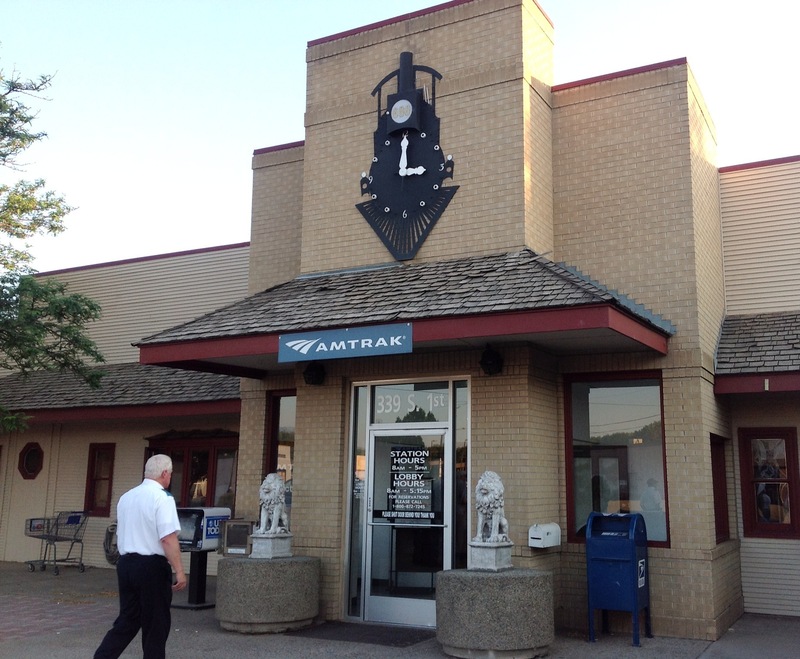 Old fashioned stations continued to be our delight as we traveled through Texas to St. Louis, Chicago, Denver, and Grand Junction ending at a newer station in Emeryville near San Francisco. 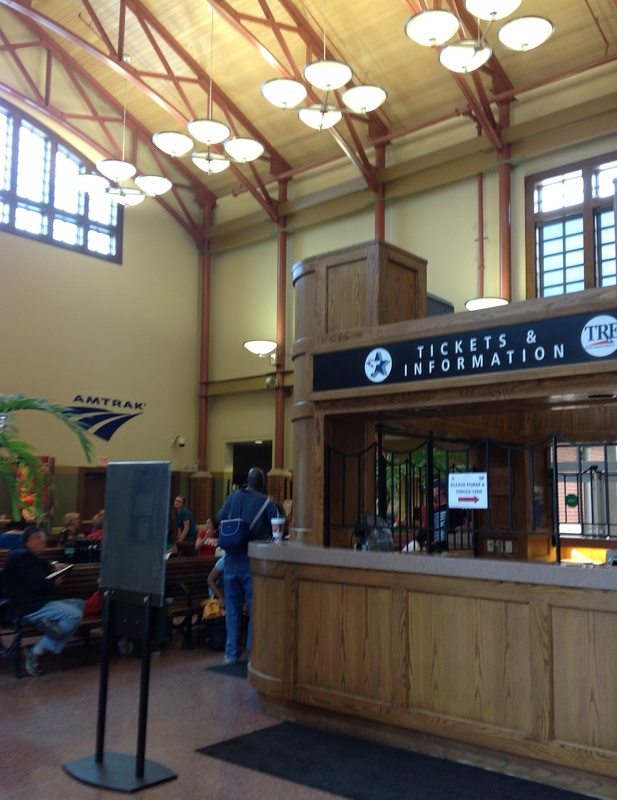 Fort Worth Texas makes use of portions of the old Union Station. Train for St. Louis arrives on track 3 in Fort Worth, TX. I haven’t mentioned food. It was EXCELLENT and freshly prepared for every meal. We dined on BBQ ribs, breaded chicken, salmon, tilapia, steak, shrimp Benedict, lamb shank, and more and everything was delicious. 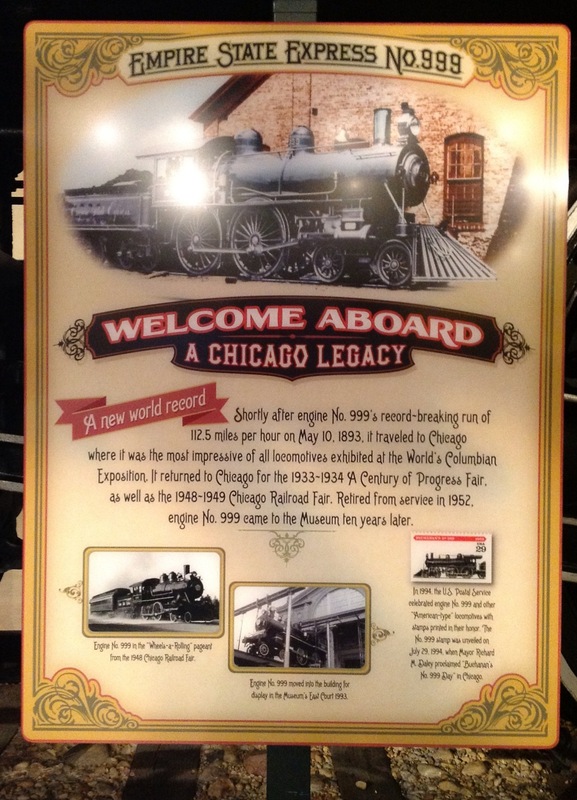 We went deeper in to the history of trains in the Chicago area with a visit to the Museum of Science and Industry before heading out back to Osaka Garden at Jackson Park, what once was known as Wooded Island at the 1893 Columbia Exposition. Empire State Express engine 999 in the Museum of Science and Industry — as fascinating a place to me now as it was when I was a child. 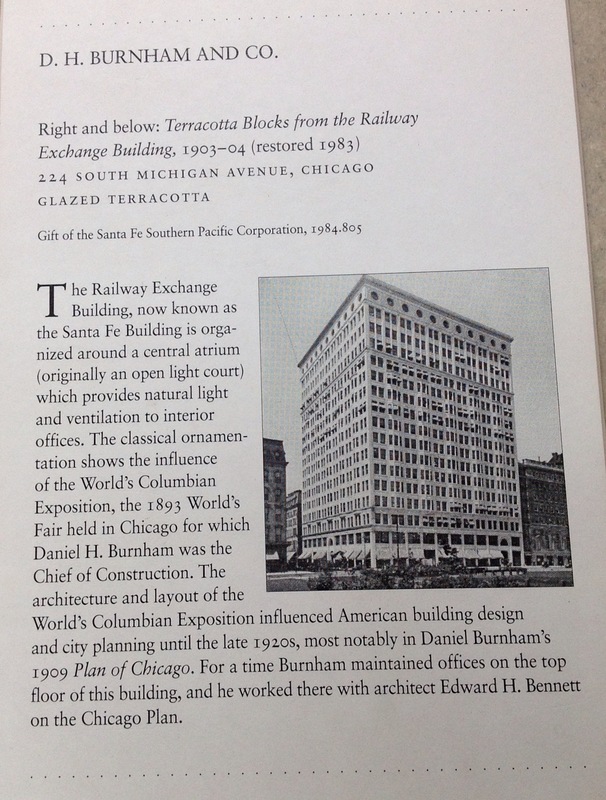 Another spot to gain more insight into historical details was the Chicago Art Institute. We had just enough time after checking our large bags in the morning to grab a cab and spend a couple of hours wandering around another old haunt for each of us: me from my childhood and Bill from his college days at University of Chicago. 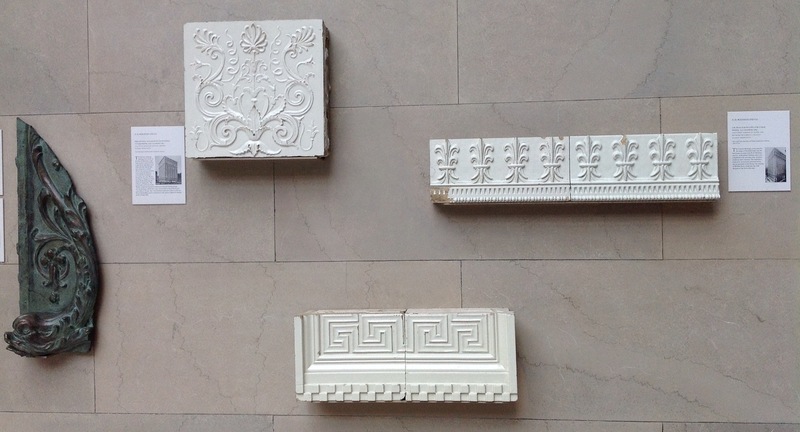 These tiles came from the Railway Exchange Building on Michigan Avenue in Chicago, also known as the Santa Fe Building. 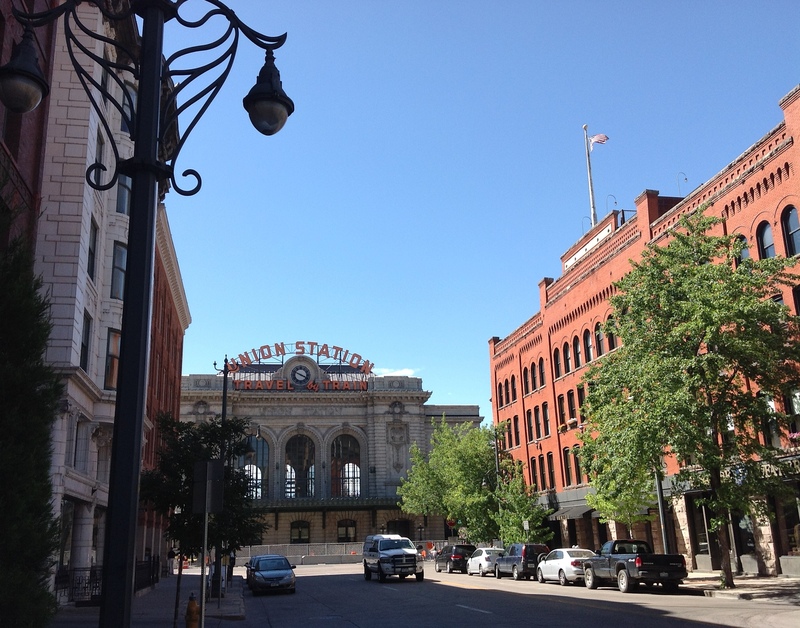 In Denver, we chose The Oxford Hotel because of its proximity to Union Station only to find that the station is undergoing a three year renovation which will result in combined services being available there. 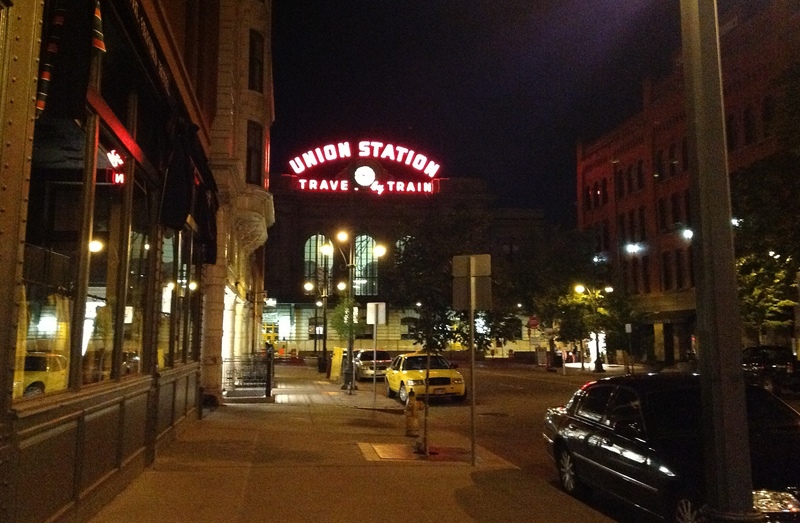 Meanwhile, the temporary station is quite a few blocks away. I would stay at the Oxford Hotel again at the drop of a hat. Wonderful staff, service, accommodations and location. 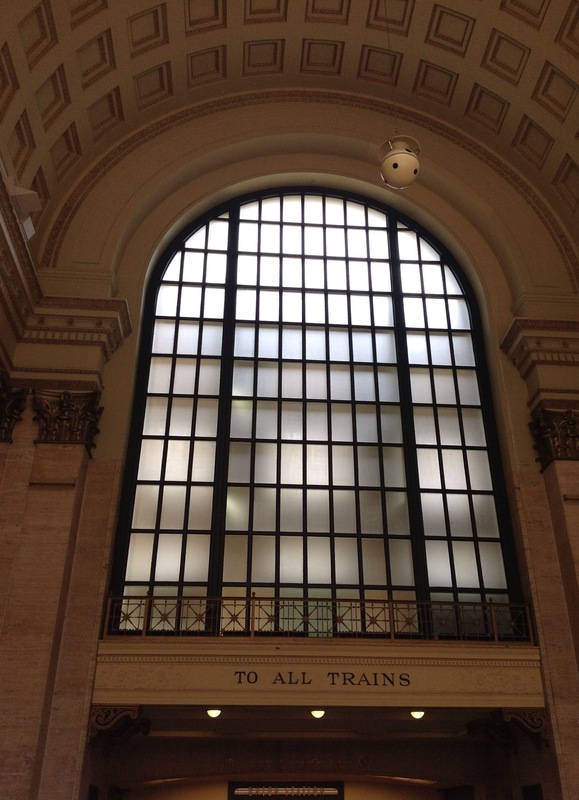 Another wonderful advantage to train travel is the view through LARGE windows. It was such a difference from the somewhat dangerous escapade of trying to see something from a speeding car while maintaining safety on the highway. 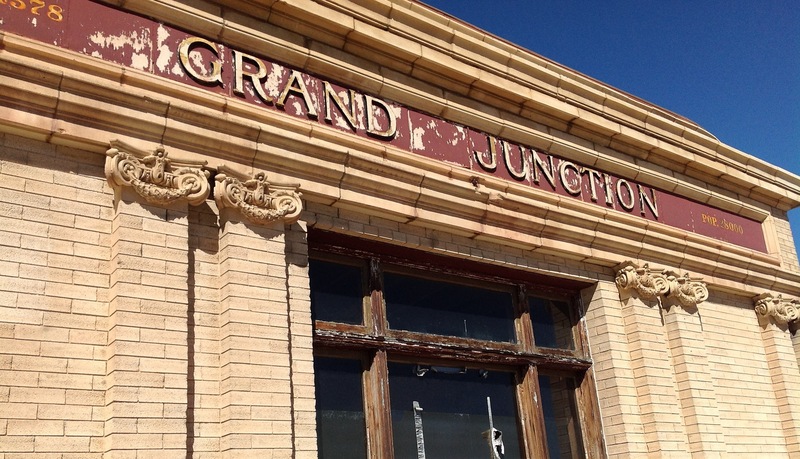 The new station in Grand Junction, Colorado is right next to the old one, now closed and boarded up. End of the line — at least as far as train travel on this journey is concerned — at Emeryville, California. Unless otherwise credited, photos in this blog are by K.T. Cannon-Eger. Click on any image for a full-size view. 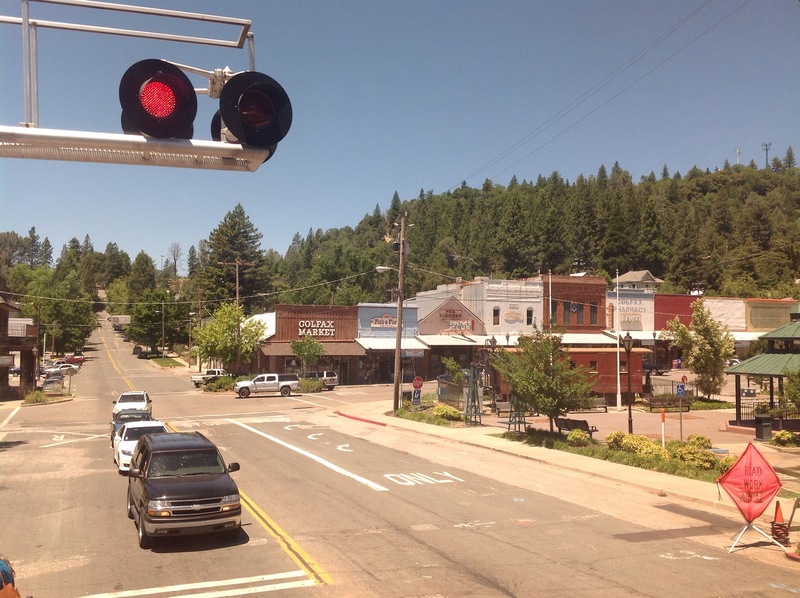 Some of our readers have asked for a little detail on our railroad adventure: what lines we rode, what the stations were like, how was the food and who got the upper berth. There is no way my husband and I could have made this trip from Atlanta to the San Francisco Bay area if it were not for Amtrak. 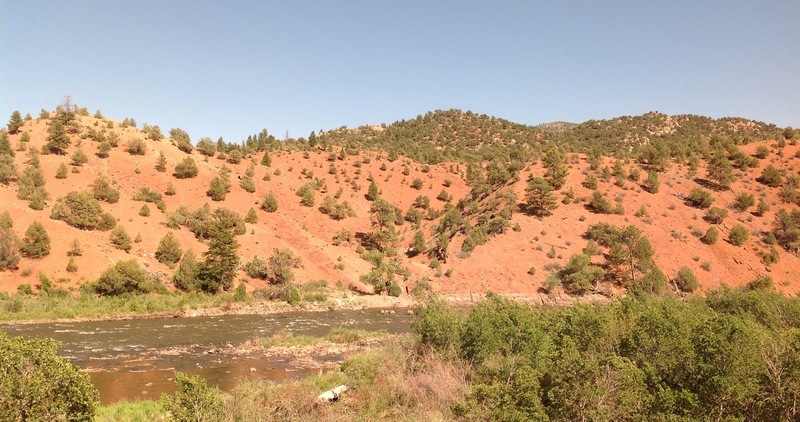 The same trip by air would have been prohibitively expensive and not nearly as enjoyable. 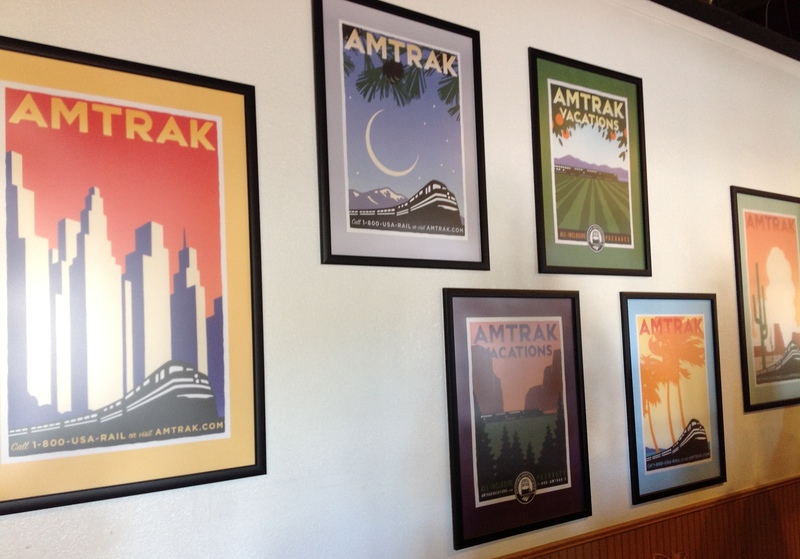 On the wall of the Grand Junction, Colorado, station is a small sampling of Amtrak posters offering guided train tours. On every train, we found engaging and delightful conversation with a wide range of fellow travelers from Switzerland, Canada, China, Australia, Holland, France, and so many states that I’ve lost count. 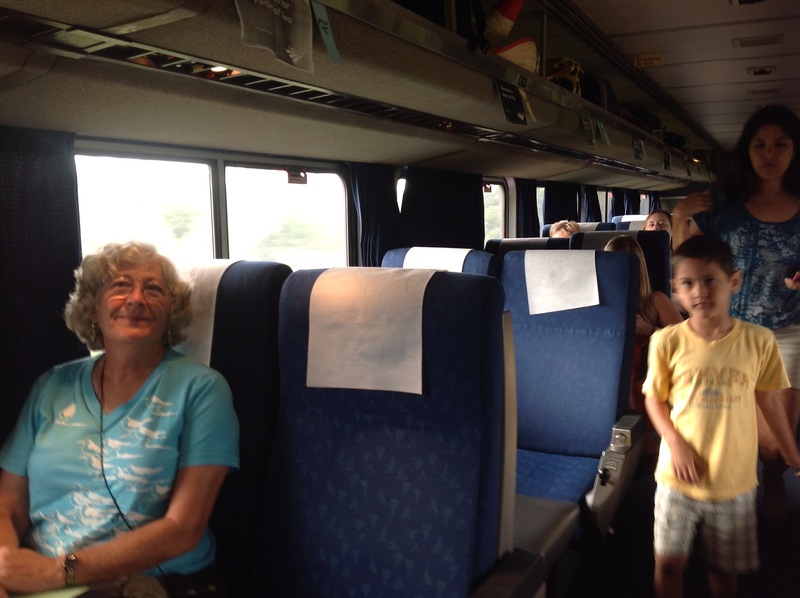 Families were traveling with their children and grandchildren. Businesspeople were going to work or coming home from conferences. Young couples were honeymooning, older couples were celebrating wedding anniversaries. All in all a wonderful mix. 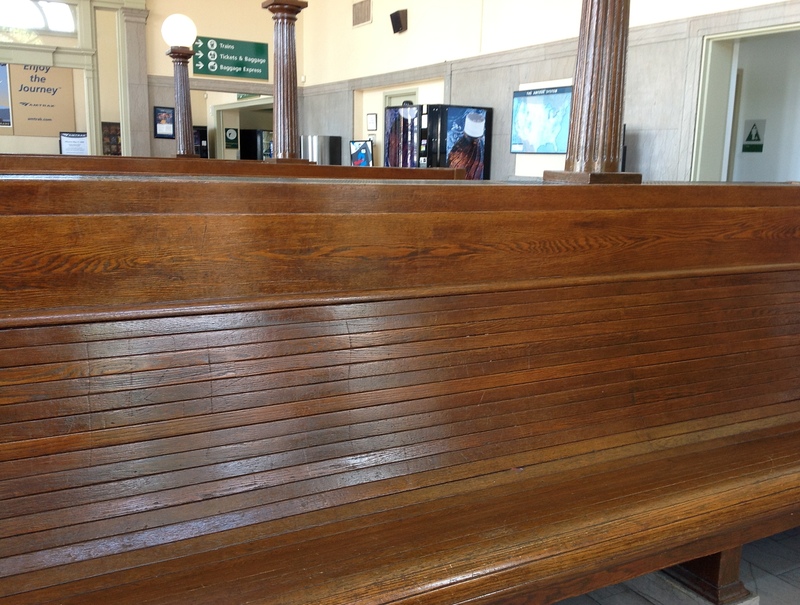 Our first train station in Atlanta, Georgia, still had the comfortable old style curved wooden benches with tall globe lamps. 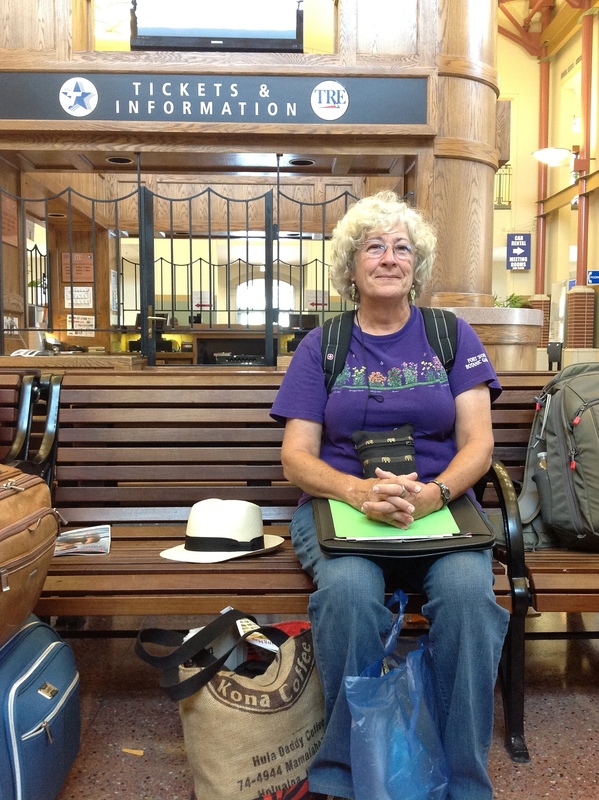 Baggage allotment is similar to that of airplanes in size and weight of luggage to be checked — and we had to do some quick switching to get the large red suitcase lighter by moving several one-pound bags of Hilo Coffee Mill whole bean coffee to the smaller purple suitcase. Giving away omiyage as we went from garden to garden plus mailing home packages of books and gifts purchased kept us at the proper check in weight. 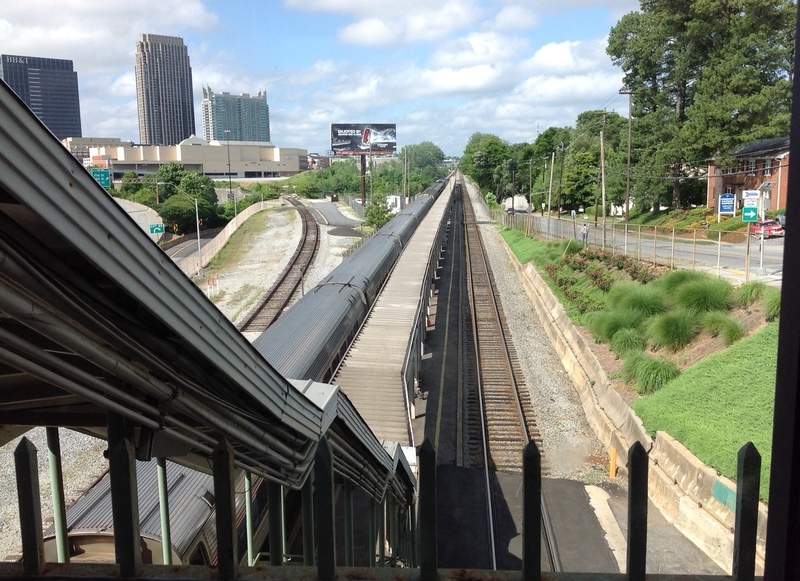 Our first train — #19 on The Crescent Line — arrives in Atlanta to take us to Birmingham, Alabama. On some legs of this journey, we reserved coach seats. 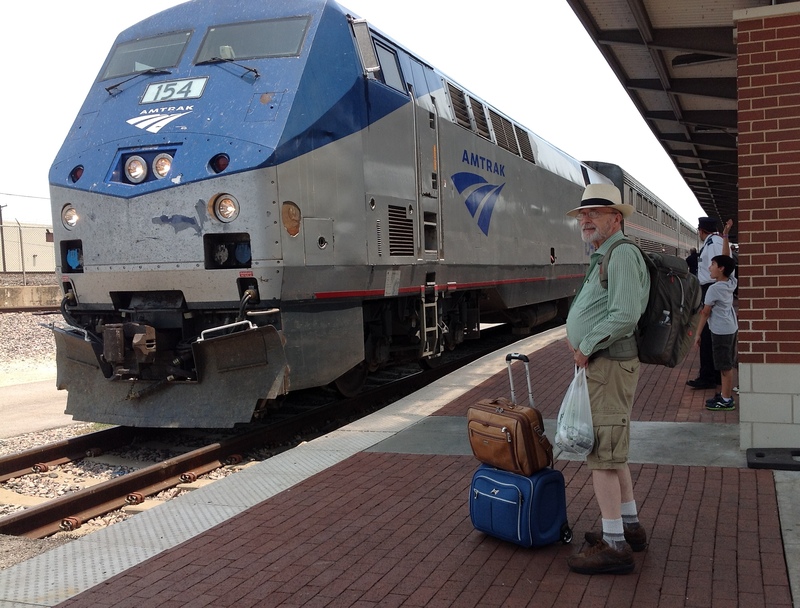 The ride from Atlanta, GA, to Birmingham, AL, had a delayed departure due to a live wire on the tracks somewhere in Virginia, but once underway, proceeded uneventfully. The Crescent Line begins in New York and goes to New Orleans. We quickly learned why our fellow coach passengers traveled with blankets. The AC was cranked up and it was COLD inside that car. Thank goodness for jackets and sweaters. Railroad Park in downtown Birmingham, Alabama, a few blocks from the Amtrak station, is full of wide open spaces used by walkers, joggers, symphony performances and yoga classes, to name a few. It was a featured stop on the Birmingham Botanical Garden’s Leaf and Petal Glorious Gardens tour. 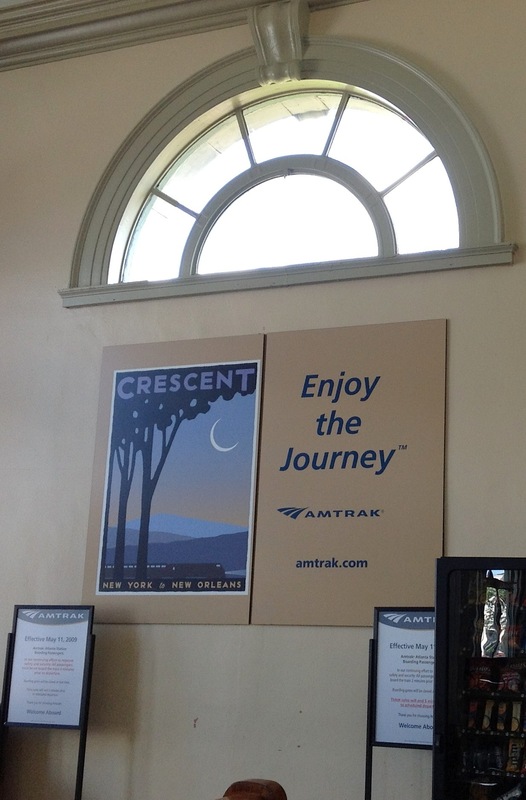 The Crescent Line continued from Birmingham, AL, to New Orleans, LA, a day-long trip for which we booked a roomette. I napped in the upper berth using both mattresses as Bill stayed seated upright in the seats below giving him a chance to wander around to the lounge and dining car. This line had some older equipment so our roomette featured a sink and toilet. Shower was down the hall. Seats were wide, roomy and comfortable. In this sleeping car, roomettes lined one side of the car with a narrow windowed aisle on the other side. 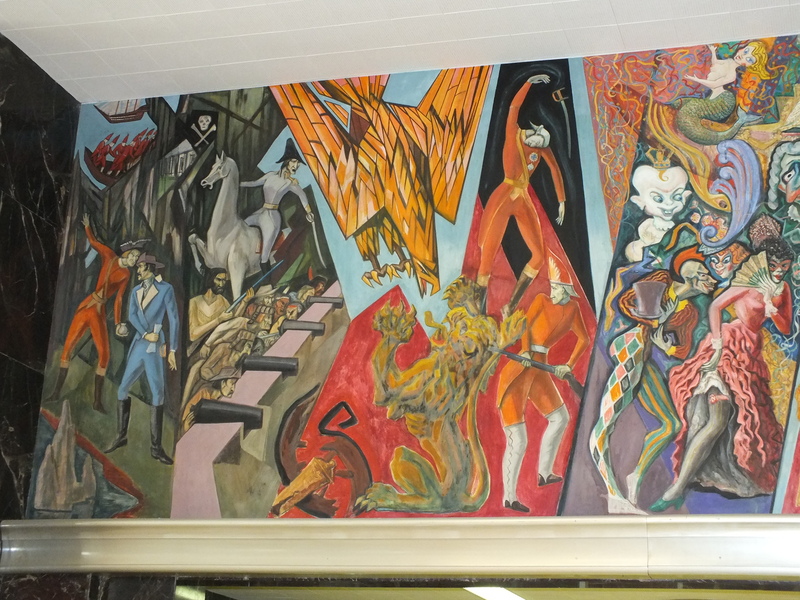 The New Orleans, Louisiana, train station features some of the most amazing frescoes I’ve seen in a long time. The New Orleans Union Passenger Terminal (NOUPT) was designed in 1949 and opened in 1954 at which time it was considered an ultra-modern facility. Featured are 120 feet (2,166 square feet) of murals depicting New Orleans and Louisiana history painted by Conrad A. Albrizio with the assistance of James Fisher. Albrizio was a renown art professor at Louisiana State University. 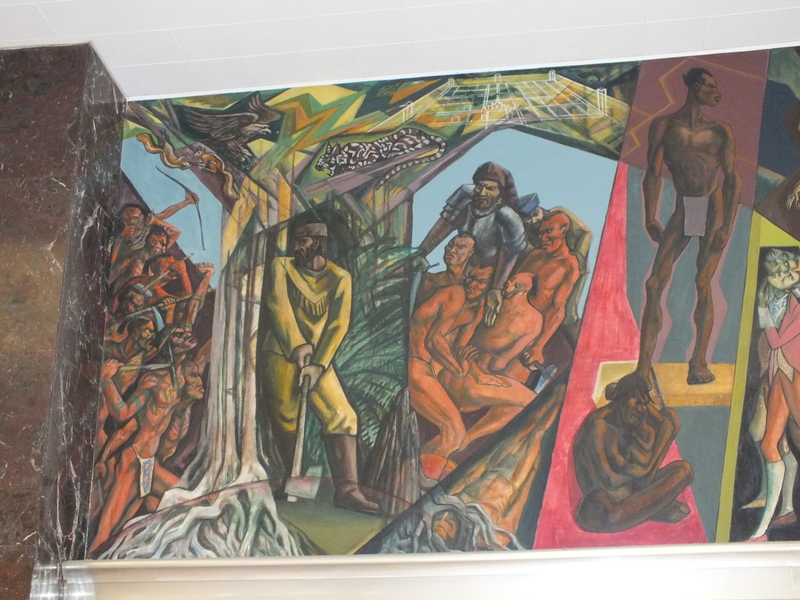 The murals in four parts depict the ages of exploration, colonization, conflict and the modern age. The murals were restored after Hurricane Katrina. 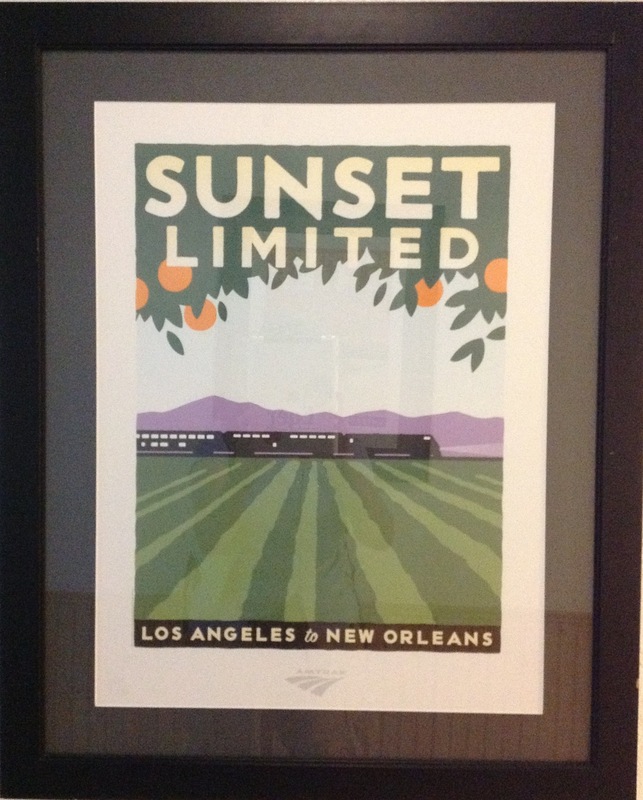 New Orleans is served by three lines: Crescent, City of New Orleans with service to Chicago, and Sunset Limited with service to Los Angeles. 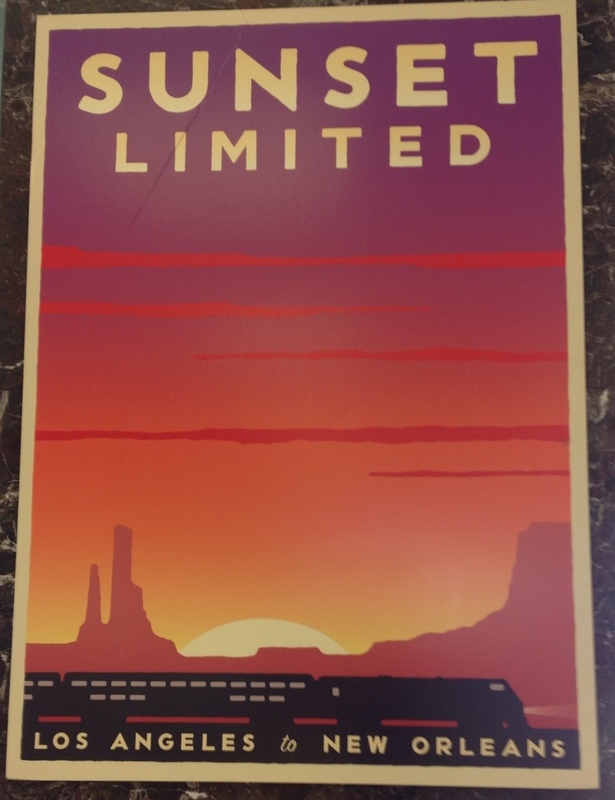 Our next leg of the journey would be aboard the Sunset Limited which used to go all the way from Los Angeles to Orlando, Florida but the section of track beyond New Orleans has yet to be replaced after Hurricane Katrina. 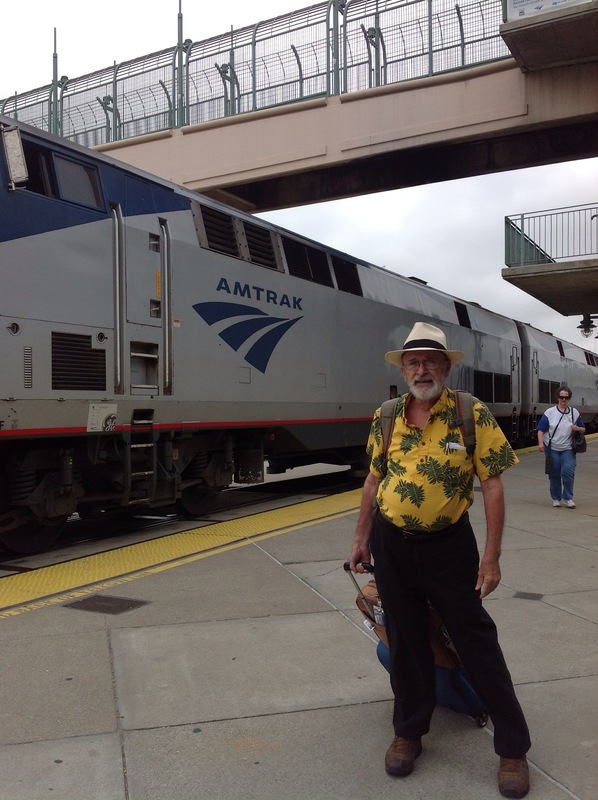 Our train left New Orleans before noon and arrived in San Antonio, Texas in the middle of the night. 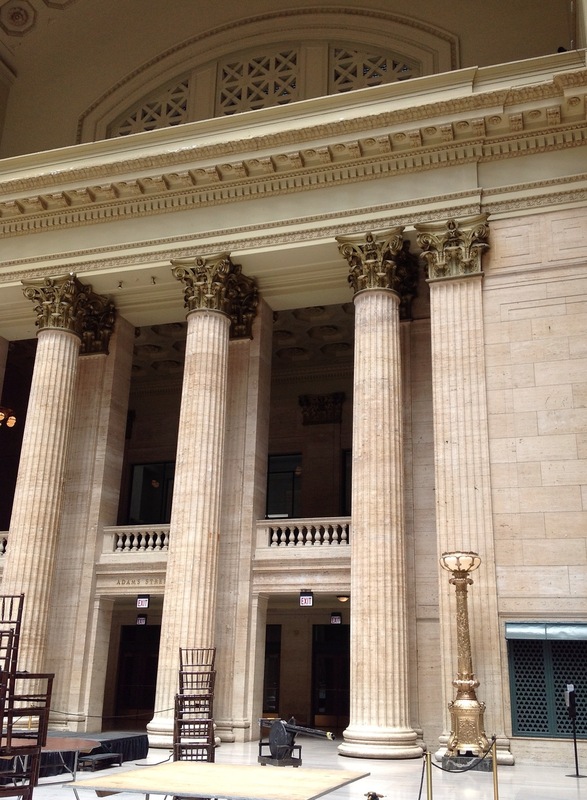 From San Antonio to Chicago, with several stops along the way, we were aboard the Texas Eagle. Sometimes we were in coach. For the long leg from Fort Worth, TX, to St. Louis, MO, we were in another roomette, this one in newer equipment that featured roomettes on both sides of a central aisle. K.T.’s window seat in coach with plenty of leg and elbow room, loads of space for carry-on baggage above plus beneath seats. 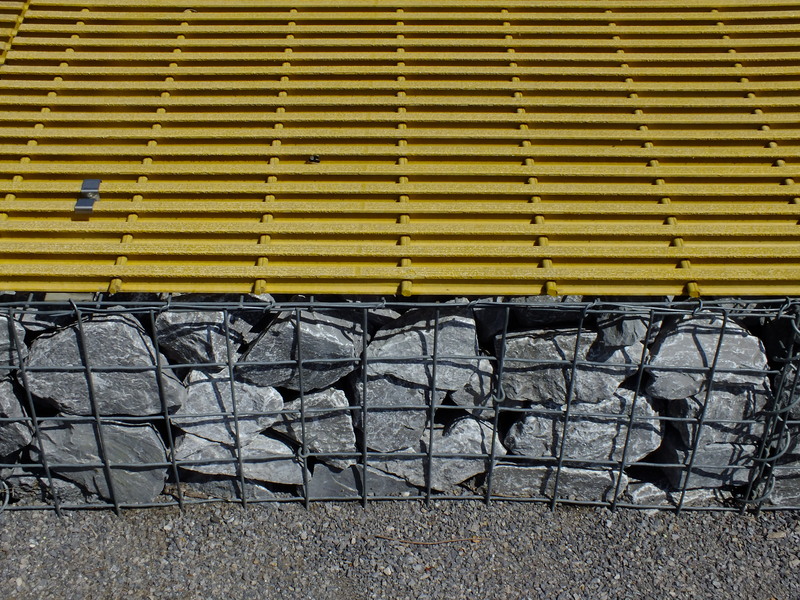 Note the different color tags stuck in a rail indicating to the conductor that passenger’s stop. 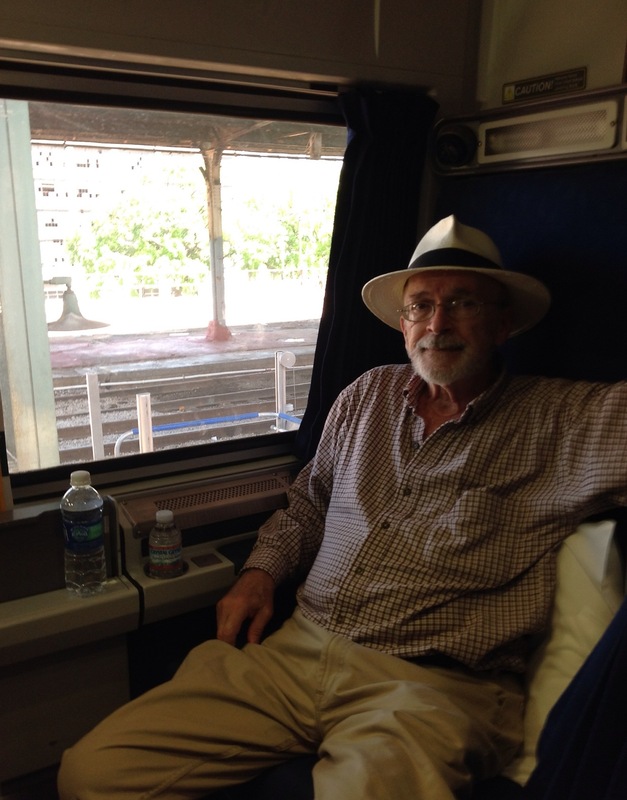 Bill enjoys the view from the large windows in this typical roomette. The upper berth drops down to just above the top edge of the window — still plenty of headroom for the person in the lower seat, but the upper berth in some sleeping cars can be rather close to the ceiling of the car. 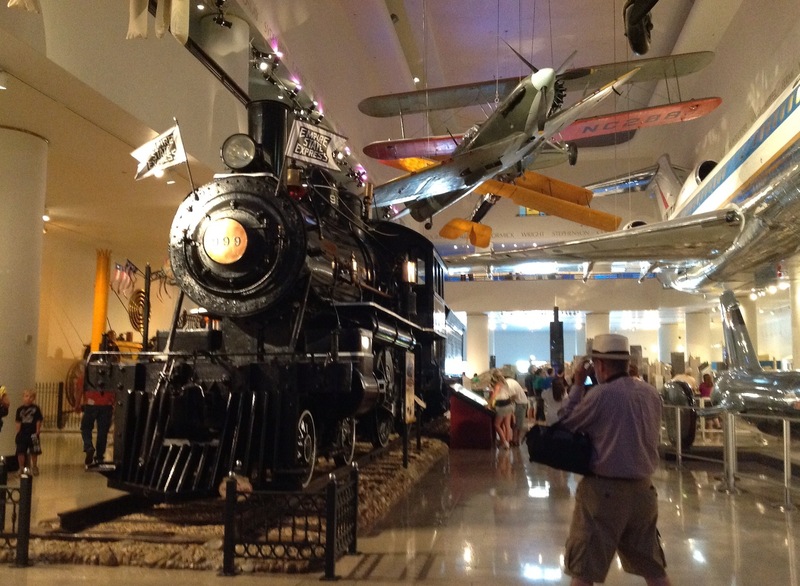 A grand railroad odyssey will begin next week in Atlanta. 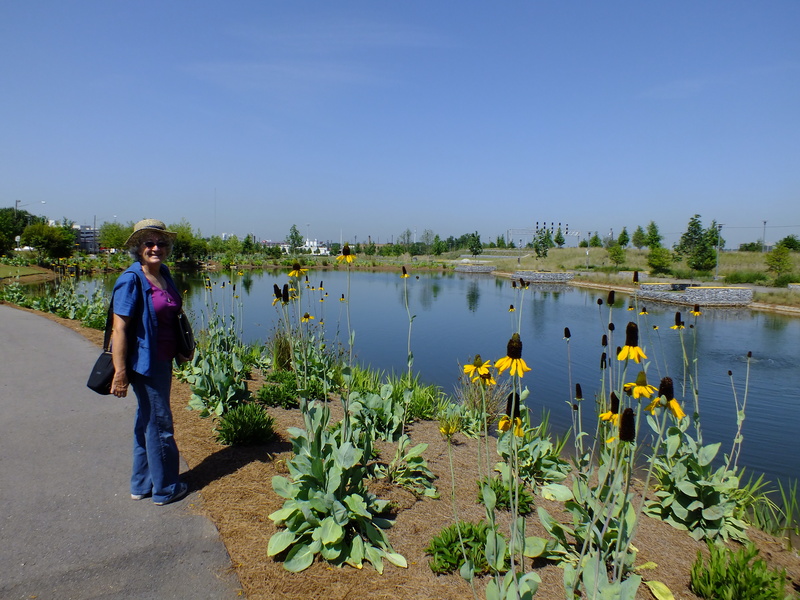 My husband Bill and I will be posting photos and stories from nearly 30 Japanese gardens across the nation. Please join us on our epic journey.